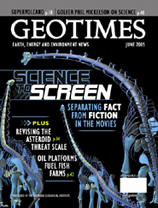 Order your free trial copy of Geotimes! Take advantage of your special promo code. How accurately do you think science is portrayed in the mass media? Want to write science news? Apply for the Geotimes fall internship! One of the world's largest volcanic systems sits below Yellowstone National Park, and although the volcano is unlikely to blow soon, interest in such an event is erupting throughout popular media. 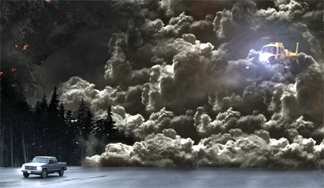 Two recent science-fiction books take vastly different approaches to covering the science and controversy behind climate change. Cinematic interpretations of the world of the dinosaurs are more engaging and complex than ever, thanks to high-tech computer imaging and new fossil discoveries. Phil Mickelson and ExxonMobil have teamed up to create an academy to help get science teachers up to par. Visit the Geotimes archives to search for past stories. Rather than shooting out information en masse, scientists need target only a handful of U.S. leaders to influence national science policy decisions. With forethought, decision-makers and scientists can work together to mitigate the hydrologic impacts of development. Many universities are adopting a business model to determine which departments stay and which go, affecting not only the faculty but also the students. Luis and Walter Alvarez propose an impact explanation for the dinosaurs demise. Three Jurassic sauropod dinosaurs come to life in these DinoMorph models that replicate their appearances and movements based on the latest in paleontology. Apatosaurus and Diplodocus (left) are stretching to reach the head height of the giant Brachiosaurus. Such models are valuable for documentaries and movies seeking to portray the ancient creatures. Image courtesy of Kent A. Stevens, University of Oregon. Read more about the making of dinosaurs for the small screen on page 30.